· The works in the exhibition will be in a state of flux, –with a past, present, future. · An artwork/object with a history, –both forgotten and familiar. · An archive and artifact, –that has been re-purposed, given a new life. · Nostalgic, –an aesthetic reminiscent of rummaging through your grandma’s attic, flea market or thrift store. Works in the exhibition will function singularly, in dialogue with one another, in dialogue with the Essex Street Market and as one whole distinct entity, an installation unto itself. Jane Benson is a sculptor and installation artist whose work explores the transition and transformation of both physical materials and aesthetic and conceptual categories. She was born in England and now lives and works in Brooklyn. She received her BFA from Edinburgh College of Art (1994) and her MFA from the School of the Art Institute of Chicago (1997). She has exhibited in national and international venues including PS1 MoMA; Sculpture Center, New York; Socrates Sculpture Park, New York; the Institute of Contemporary Art, Philadelphia; and the Scottish National Gallery of Modern Art, Edinburgh. Solo shows include “The Splits” at Henry Street Settlement: Abrons Art Center, New York, The Mews, at Thierry Goldberg Projects, New York; Chronicles of Narcissism, Black & White Gallery, New York and Underbush, Roebling Hall, New York. She has been the recipient of numerous awards and residencies including the Pollack-Krasner, the Fulbright Scholarship and the New Views: World Financial Center Residency and The Vaults: Swing Space, Lower Manhattan Cultural Council, New York. Her work has been reviewed in the New York Times, Artforum, Art in America, ARTnews and the New Yorker among others. Nicole Cherubini was born in Boston in 1970. She received her BFA in Ceramics from the Rhode Island School of Design and her MFA in Visual Arts from New York University, and later attended the Skowhegan School of Painting and Sculpture in Maine. She is a recipient of an NEA Travel Grant, a New England Foundation for the Arts Fellowship in Sculpture, the Louis Comfort Tiffany Foundation Award, and most recently an Art Matters Grant for travel in Mexico. Her work has been exhibited in group and solo exhibitions both internationally and in the United States; including the Institute of Contemporary Art, Philadelphia; the Walker Art Center, Minneapolis; Santa Barbara Contemporary Arts Forum, Santa Barbara, CA; Sculpture Center, New York; La Panadería, Mexico City; PS1/MoMA, New York; The Rose Art Museum, Boston; Samson Projects, Boston; and Galerie Michael Janssen, Berlin. Last fall, she had concurrent exhibitions at Smith Stewart Gallery and D’Amelio Terras in New York. Cherubini lives and works in Brooklyn, New York. LaToya Ruby Frazier was born and raised in Braddock Pennsylvania. She earned a B.F.A in applied media arts at Edinboro University of Pennsylvania in 2004, and an M.F.A in art photography from Syracuse University in 2007. She has been an artist in resident at Art Omi in 2009, Center for Photography at Woodstock in 2008 and Skowhegan School of Painting and Sculpture in 2007, the Lower Manhattan Cultural Council and New York University in New York City. She is currently an artist and resident in the Whitney Museum of American Art Independent Study Program. She is the Associate Curator for the Mason Gross Galleries in the Department for Visual Arts where she also teaches photography in the Mason Gross School of the Arts at Rutgers University, New Brunswick NJ. Ellen Harvey was born in the United Kingdom and lives and works in Brooklyn, NY. She is a graduate of the Whitney Independent Study Program and the PS1 Studio Program. She has exhibited extensively in the U.S. and internationally and was included in the 2008 Whitney Biennial and was recently commissioned to produce a new work for the opening exhibition of the Turner Contemporary in Margate, U.K. Recent solo exhibitions include The Nudist Museum at the Bass Museum, Miami Beach, FL, Picturesque Pictures at Galerie Gebruder Lehmann and The Doppleganger Collections at Magnus Müller both in Berlin, Germany, Empty Collections at Galerie Meessen de Clercq, Brussels, Belgium Private Collections at Locks Gallery, Philadelphia, Ruins are More Beautiful at the Center for Contemporary Art, Warsaw, Poland, The Museum of Failure at Luxe Gallery, New York, Mirror at the Pennsylvania Academy and A Whitney for the Whitney at Philip Morris at the Whitney Museum at Altria. She has completed projects for both the New York and Chicago Transit Authorities, most recently including a mosaic for the new Metro-North Yankee Stadium Station. Her book, The New York Beautification Project, was published by Gregory Miller in 2005 and Ellen Harvey: Mirror was published by the Pennsylvania Academy in 2006. Jason Hedges is a Miami based artist whose practice is confined to exploring food & drink and humanities relationships with them throughout history. The work draws from the inherent beauty as well as the cultural significance that we have developed. The work is often interactive or a by-product of an action. His work has been exhibited locally and international and featured in numerous periodicals and art journals. His works can be found in numerous public and private collections and exhibits regularly in museums, galleries, art fairs and other institutions. Michael Mahalchick was born 1972 in Pennsylvania and has exhibited his work internationally at Atelier Cardenas Bellanger in Paris, Kate McGarry in London and in New York at PS1 and the Sculpture Center. In addition to his sculpture practice, he choreographs dance, performs and produces sound and video art. He has performed internationally with Discoteca Flaming Star most recently at the Whitney Museum of American Art and The Kitchen. The artist received a MFA from California Institute of the Arts and now lives and works in Brooklyn, New York. Robert Melee was born in 1966 and lives and works in both New York and New Jersey. To date he has worked in film, photography, performance, sculpture and painting and has shown his work extensively in the United States and abroad. He has had recent solo shows at Ingalls & Associates, Miami (2006); The Kitchen, New York (2006); Sutton Lane Gallery, London (2005); Milwaukee Art Museum, Milwaukee (2004); White Columns, New York (2003); Corcoran Museum, Washington D.C. (2001); and Jay Jopling / White Cube, London (2000). His work has been included in group exhibitions at Mireille Mosler, Ltd. New York (2008); Comme il Faut Gallery, Tel Aviv (2008); Friedrich Petzel Gallery, New York (2007); Kantor/Feuer Gallery, Los Angeles (2007); P.S. 1 Contemporary Art Museum, Long Island City (2005); Gallery Hyundai (Do Art), Seoul (2005); Gagosian Gallery, New York (2002), and the Aldrich Museum of Contemporary Art, Ridgefield, Connecticut (2002). Diana Shpungin is an artist who works in video, sound & drawing installation. She was born in Riga, Latvia & lives & works in Brooklyn, New York. She received her MFA from the School of Visual Arts, New York, New York, & her BFA from Florida Atlantic University, Boca Raton, Florida, where she studied Sculpture, Film & Video. Shpungin has recently taught at Florida Atlantic University & has lectured at numerous other universities & art schools. Shpungin has also curated exhibitions such as Delicatessen at Schmidt Center Gallery, Florida Atlantic University, Boca Raton, Florida. As well as co-organizer for Co-dependent, in Miami, Florida, involving 12 curators and 80 artists, where lead participants each choose other potential participants. 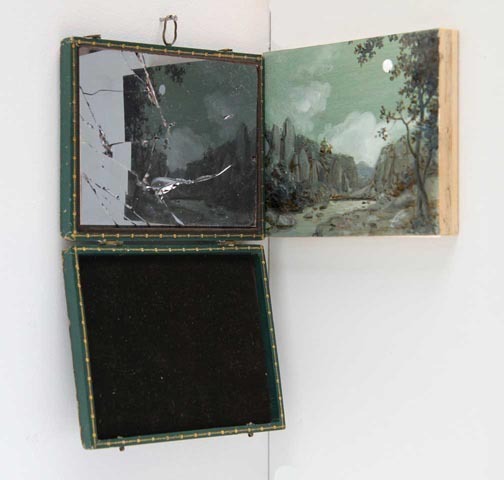 Image: Broken Claude Glass, Ellen Harvey, 2010, Claude mirror in case, 4” (10.2) X 6” (15.2cm) when closed, oil on wood panel, 4” (10.2) X 6” (15.2cm), Ellen Harvey, 2010. Photograph: Jan Baracz. Private Collection, Courtesy of DODGEgallery.